Former Self is an active Indianapolis band that combines myriad influences of metal, punk, and classic hard rock into their own unique sound. The band formed in December of 200 under the name of Usually Last with Brendan Enright, Dillon Enright, Adam Shackelford, and Robbie Soper. 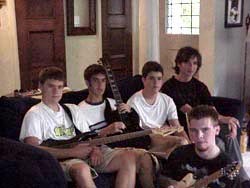 After several lineup and name changes the band went to Funhouse Studios on July 26 & 27, 2001, with Brendan Enright and Adam Shackelford on guitars, Dillon Enright on drums, Paul Jansen on bass, and Gabe Zentner on vocals. 5313 N. New Jersey St.